Hinduism has both masculine and feminine representative deities of the supreme power of the universe. All major deities have both male and female counterparts. Goddesses in Hinduism are the representation of Shakti, the feminine source of power in the universe. They are highly revered and powerful. They play a central role in the creation, protection, and destruction of the universe. 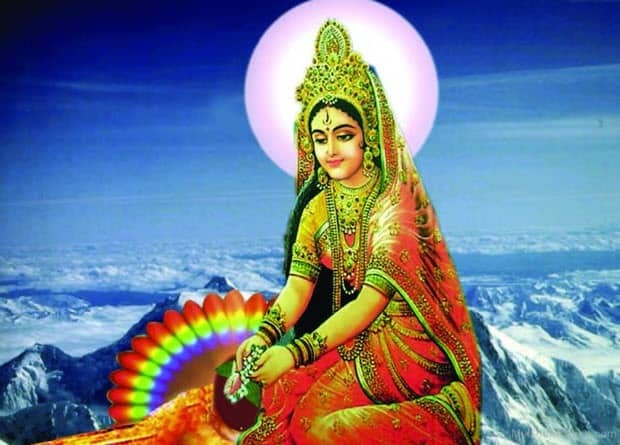 Here is the list of 10 Hindu Goddesses that are the source of the power in the Hindu religion. Radha is almost always portrayed alongside Krishna. 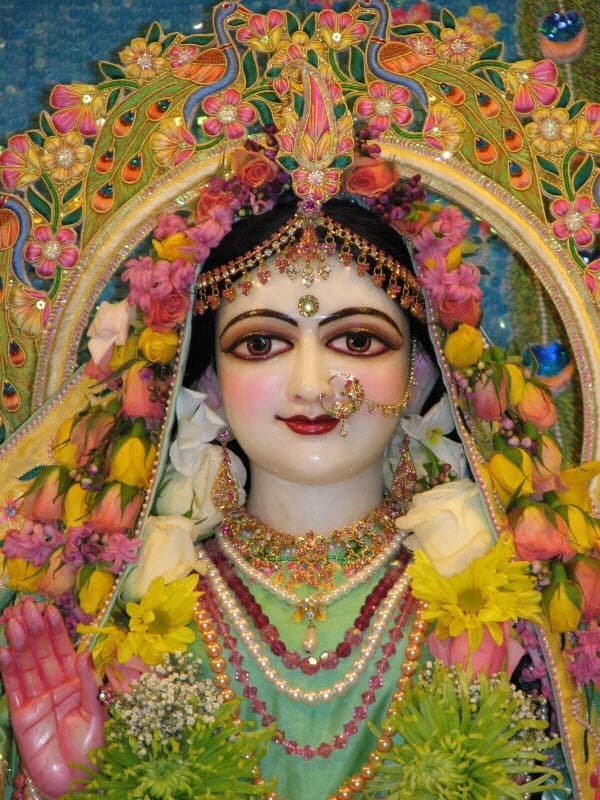 She is also known as Radhika or Radharani. It is believed that Radha and Krishna are incomplete without each other. Radha is the companion and friend of Krishna, who is also his divine power and the Shakti. While Radha is not the incarnation of goddess Lakshmi (the consort of Vishnu), she is regarded as higher than Rukmini (the wife of Krishna, and the incarnation of Lakshmi). Radha is known for her immense devotion towards Krishna, which shows the longing of each devotee to be united with the supreme. It is through the power of her devotion she was able to achieve the status of a goddess and worshiped by a large number of devotees. Kamadhenu is the mother of all cows and the goddess of plenty. She is capable of fulfilling the truest wishes of her devotees. Her iconography describes her as a cow with the head of a woman and breasts, or as the cow containing various deities inside her. 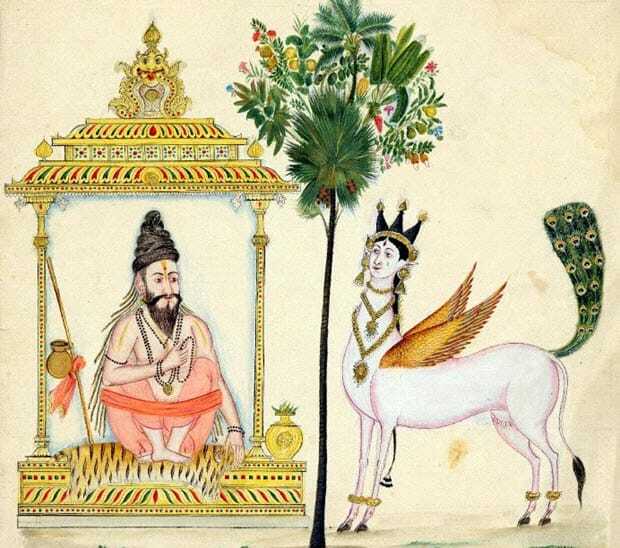 Kamadhenu emerged in the process of the great Samudra Manthan, which was the churning of the great oceans together by the Asuras and the Devas. Cows are revered in Hinduism because of the goddess Kamadhenu. Each part of Kamadhenu’s body carries symbolic importance. For example, her four legs represent the four Vedas, the horns symbolizes the gods, the humps stand for the Himalayas, etc. The cow is also worshiped as the mother of the earth as her milk nourishes human life. 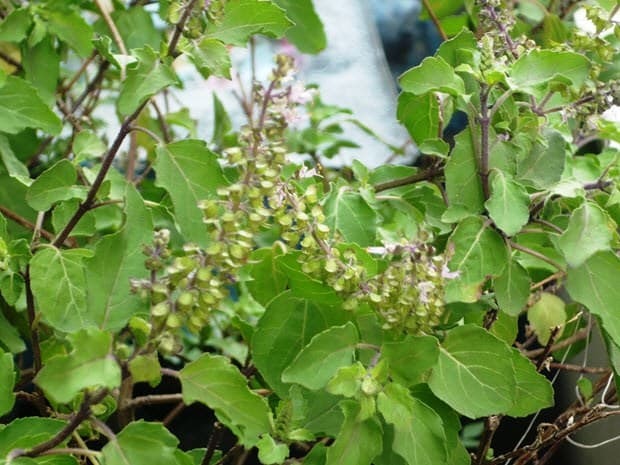 Tulsi is the goddess worshiped and revered in the form of a basil plant. The herb/plant has medicinal as well as mythological importance in Hinduism. 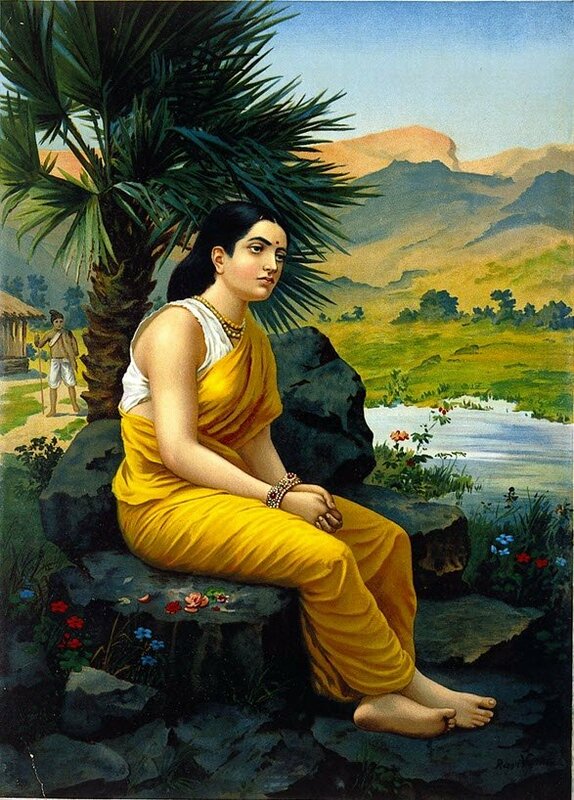 The story of Tulsi is often associated with Vrinda and Jalandhar. Jalandhar, who was born through the third eye of Lord Shiva became very powerful and threatened the existence of the gods. His power was also a result of the devotion and fidelity of his wife Vrinda, who was an ardent devotee of Vishnu. In order to kill Jalandhar and save the world and the gods from his wrath, Vishnu decided to take the form of Jalandhar and approach Vrinda, thus causing her to comment infidelity towards her husband. This deprived Jalandhar of his powers achieved through the devotion of his wife. After realizing that it was Vishnu, Vrinda curses him to be born as a stone which is the Shaligram. She eventually throws herself into the pyre and is reborn as Tulsi. Ganga, the river is a popular goddess in Hindu mythology. She is the daughter of Parvat Raj Himalaya or Himavan and sister to goddess Parvati. She ascended towards heaven to cleanse the sins spread by Tarkasur, one of the demon kings. She descended back on earth to rinse away the sins of the humankind at the request of Shiva. During her descend Ganga was held on in the hair of Shiva to prevent the destruction of Bhumi Devi (mother earth) as Bhumi Devi would not be able to bear the waters falling from heaven. Ganga to the present day flows as the river through the Himalayas and down to the plains of India. Devotees strongly believe that dipping into the holy river washes away sins and negativity. Sita, also known as Janaki is the incarnation of Lakshmi. She is the daughter of Janak, the king of Janakpur. Her name Janaki comes from her birthplace. Janaki Mandir, located at Janakpur in Nepal is dedicated to Sita. She is believed to have been evolved from Bhumi and is also the daughter of mother earth. She is the consort of Ram and a central character in the epic Ramayana. Sita follows Ram in his 14 years exile from Ayodhya during which she is abducted by the demon king of Lanka, Ravana. It is this act of Ravana, that leads to the battle where Ram kills Ravana and saves Sita. She is also remembered and revered for the Agni Parikchya she gives at Ram’s order to prove her chastity. Sita is the representation of feminine power and virtues in Hinduism. Kali is the fierce representation of Shakti. She is also known as the destroyer or the one who liberates the soul and provides moksha. She is an incarnation of Parvati/Durga. Kali was born to defeat the demon named Raktabeech, who had the boon that each drop of his blood that touches the ground would evolve into a new powerful demon. 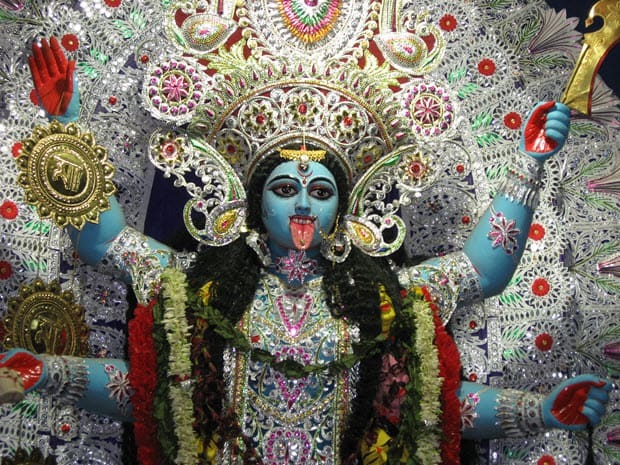 Thus, Kali is seen as a fierce angry goddess with the garland of skulls, a knife and a bowl in her hands. During the battle she had to cut Raktabeech, fill her bowl with his blood and drink it. She continued doing so and as a result became very aggressive and destructive. To protect the world from her anger, Shiva, her husband lay down under her feet to calm her down. As a result, she bit her tongue due to embarrassment after realizing her mistake. Thus, her iconography also has lord Shiva lying beneath her feet and Kali biting her tongue. 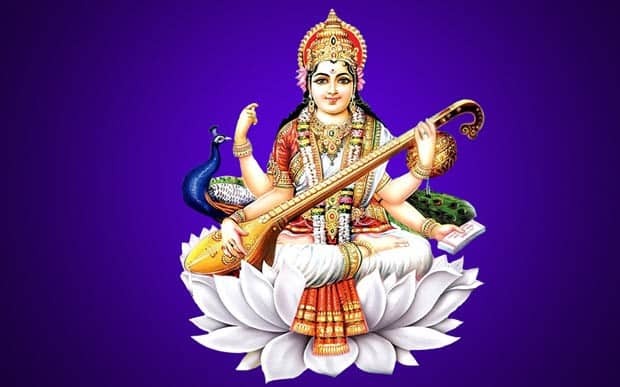 Saraswati is the goddess of wisdom, music, and learning. She is also known as Sharada. She is the wife of Brahma. Saraswati is one of the goddesses among the Tridevi, which is the feminine counterpart of the Tridevs in Hinduism. Her vahan is the swan or the goose. Her iconography is portrayed with four hands two of which hold the veena, a musical instrument. Saraswati Puja is observed on the day of Basantapachami, which is also the first day of spring. Devotees wake up early in the morning and pay homage to her temples hoping to be blessed with wisdom and knowledge. 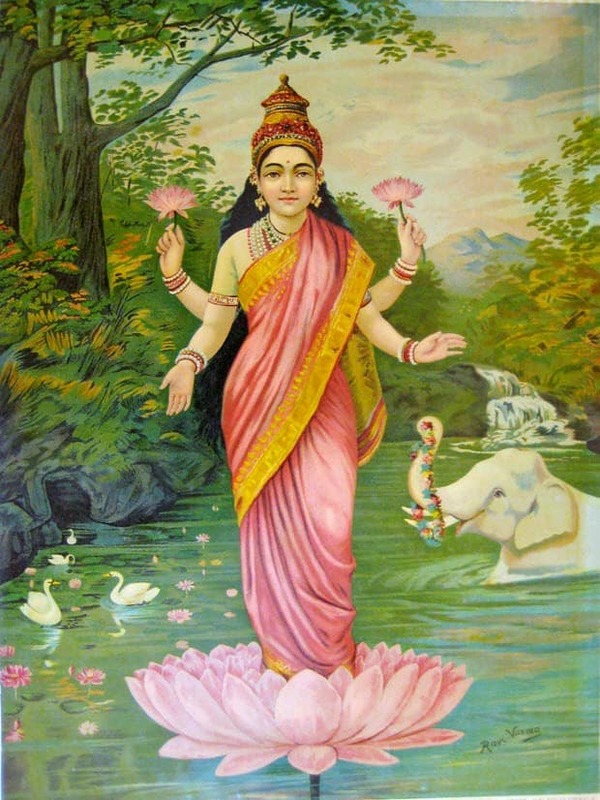 Lakshmi is the well-known goddess of wealth, abundance, and fertility. She is worshiped during the festival of Deepawali, the festival of lights. It is believed that the cleanest and the most beautiful house will be chosen by Lakshmi on the night of the festival. Thus, devotees clean and decorate their houses with lights, garlands of flowers during the festival. 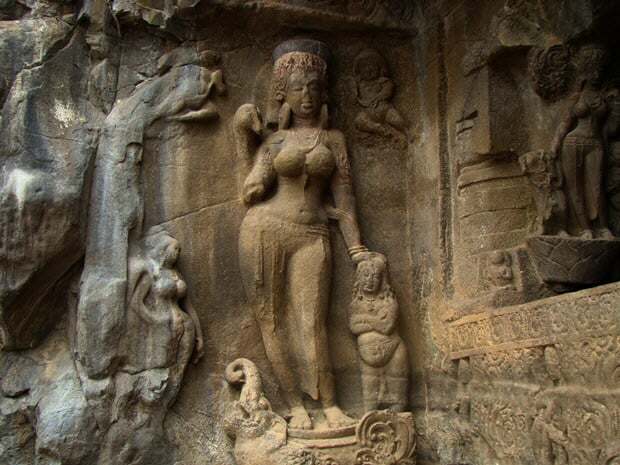 She is also one of the goddesses in Tridevi. She is the wife of Vishnu and reincarnates alongside her consort on earth. Lakshmi does not only represent materialistic wealth but also glory, joy, and honor. Her vahan is the owl and also the white elephant Airawat. Parvati is one of the goddesses among the Tridevi. She is also known as Gauri. She is also the wife of Shiva and the mother of Kumar and Ganesh. Parvati is the rebirth of Sati, who was once the wife of Shiva but plunged into the fire due to her father’s insulting behavior towards her husband. Parvati was born as a mortal to Parvat Raj Himalaya. It is through constant penance and devotion she was able to attain the full power of Shakti and become one of the most revered goddesses and also the rightful wife of Shiva. Parvati is the caring and motherly representation of Shakti. Her vahana is depicted as the lion or tiger. Durga is perhaps one of the most well-known manifestations of Shakti. She is one of the principal deities worshiped in Dashain/Navaratri, one of the most important festivals of Hindu devotees. It is also the celebration of the death of Mahisasur, one of the most powerful demon gods. Mahisasur with his power of devotion was successful enough to get the boon of only being killed by a woman. The demon king believed it to be impossible for a goddess to be powerful enough to be able to kill him. 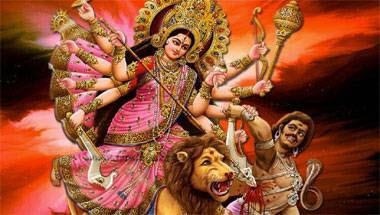 Durga is thus also known as Mahisasur Mardini (the slayer of Mahisasur). She is also the representation of the feminine power and roles in the universe. Her iconography shows her riding the lion or the tiger and holding the Trishul. She is also portrayed with multiple hands and the dead body of Mahisasur being stabbed by her Trishul. Goddesses in Hinduism are the divine representation of the cosmos and they are complementary to their male counterparts. Both the masculine and the feminine deities complete the divinity of the universe. The ultimate goal is the operation of the universe and the protection of nature and destruction of ailments that evolve. Female deities can be seen as functional deities with each goddess representing a part of Shakti and the cosmos. Different deities are worshiped by different devotees on the basis of their philosophy and ideology, which ultimately is the form of the cosmos. Not sure how much is already written elsewhere, but this is the first post on the wonder women of our land. I really wish someone would go around reminding what and who, “WOMEN” actually are in this land. And stop treating them like vulnerable-weaklings and marry them off mechanically! I so wish Shiva unleashes Ganga in all her might upon this wretched world!